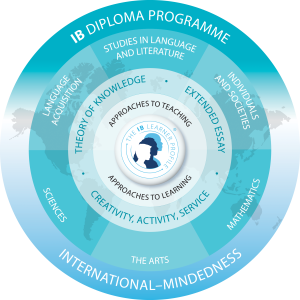 IB stands for International Baccalaureate®, a non-profit educational foundation founded in 1968 that offers four international education programmes aimed at developing the intellectual, personal, emotional and social skills students need to live, learn and work in a global world. Over the years, the IB has built a solid reputation for quality teaching, pedagogical leadership, and student achievement. We collaborate with schools, governments and international organizations to create and develop challenging international education programmes and rigorous assessment methods. The International Baccalaureate® aims to develop young people who are caring, informed, eager for knowledge, and who are capable of contributing to creating a better world within the framework of mutual understanding and intercultural respect. In order to teach IB programmes, schools must obtain the appropriate authorization. When a school is approved, it is renamed an “IB World School“. Hamelin-Laie International School is an “IB World School“. Of the four IB programmes, our school offers the IB Diploma Programme (PD), aimed at youths aged 16 to 19. It is a rigorous and balanced educational program that is an excellent preparation for university and adulthood. The programme is recognized by prestigious universities from all over the world. The International Baccalaureate® Diploma Programme (IBP) consists of six areas of knowledge and three core components. The student must choose a subject from each of these six areas with an orientation to his or her university degree or further studies. There are two types of subjects: High Level or Standard Level (depending on the number of teaching hours per week) and may vary slightly from one year to the next. The three core components are mandatory for all students..
Extended essay: Students conduct independent research through in-depth study of a subject that may be related to one of the subjects of the Diploma Programme. Theory of Knowledge: Aims to develop a coherent approach to learning that unifies the different academic areas. Students explore the nature of knowledge and their critical thinking is enhanced, ‘learning to learn’. Creativity, Activity and Service (CAS): The area of creativity encourages students to engage in the arts and use creative thinking. The action area seeks to develop a healthy lifestyle through physical activity. The community service area aims to encourage students to take responsibility and develop values of respect and solidarity. All three areas of CAS foster the personal and interpersonal development of students through experiential learning. Offer ongoing international education programmes. Encourage students to acquire an international mentality and to go beyond their immediate environment. Develop independently of government and national systems, incorporating quality practice from research and their global community of schools. Encourage students to think critically and challenge assumptions. Additionally, make students take responsibility for their own education through the Theory of Knowledge. Empower students to actively participate in their communities and make learning happen beyond the academic realm. Offer the IB in at least two languages. The student must take courses from six subjects (one from each group). A minimum of 3 and no more than 4 of these subjects should be chosen from the higher level, and the rest from the standard level. The student may choose an additional subject from groups 3 and 4 instead of group 6. The student must complete 3 additional core requirements stated in the subject areas of Theory of Knowledge, Extended Essay and show active participation in the C.A.S. program (Creativity, Activity and Service). The marks given are on a scale of 1 (minimum) to 7 (maximum) with a 4 considered passing. This is the case for all six of the evaluated subjects. There are 3 additional marks for the students’ performance in Extended Essay and Theory of Knowledge. The diploma can be obtained with a minimum mark of 24 points and maximum of 45. Students are required to have carried out the C.A.S programme at a satisfactory level. The required mark for admission into a Spanish university is based on a concordance table calculated by the student´s mark obtained in the diploma and the Selectividad Common part score. Students who are interested in obtaining more than a mark of 10 should also be examined in the Specific part of the Selectividad. Note: It is not possible to combine either Philosophy and Global Politics or Business and Management and Economics. Note: It is not possible to combine either Biology and Design Technology or Physics and Environ. Systems and Societies. Note: It is not possible to combine either Visual Arts and Chemistry (Group 4). Note 2: Students who wish to do so can omit group 6 and choose an extra subject from groups 3 and 4.